It's that time of the year again. Most of my stories, food or otherwise revolve around our vacation time growing up that we spend in India, usually once a year. The hustle bustle, the vibrant colors, the chaotic traffic and the glorious glorious food were all part of the fun we talked about rest of the year. Since Tasnim was born this is our first vacation to India and we are mighty excited. Now that she takes a bit of spicy food, we might finally introduce her to some spicier Rajasthani fare! If you don't follow me on Instagram where I post regularly - you might be able to catch glimpse of the fun and food. 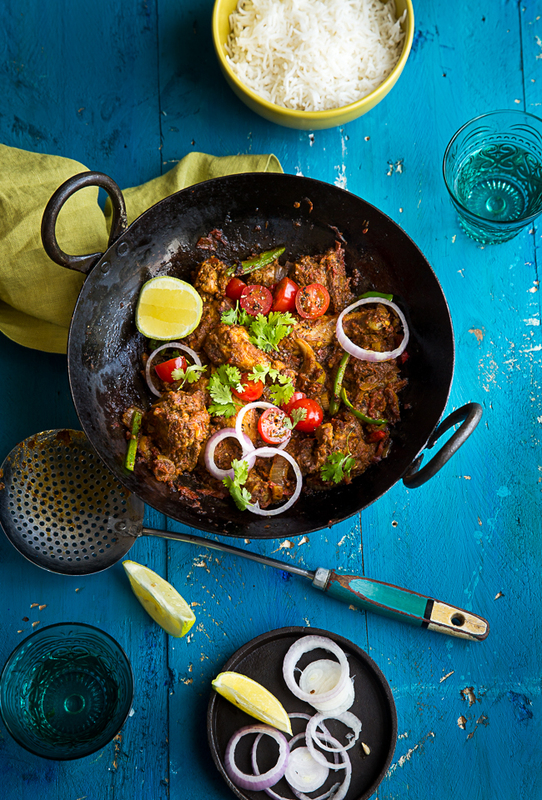 Meanwhile, here's a tantalising chicken recipe that is sure to be a family favourite. This is slightly an unconventional recipe considering the use of dried tomatoes but it is something I use regularly with chicken recipes. The intense flavour adds another dimension which is sometimes difficult to achieve with tomatoes or even tomato paste. Not that chicken Jalfrezi is an authentic Indian recipe anyway even though I have seen it in restaurants in India as well. 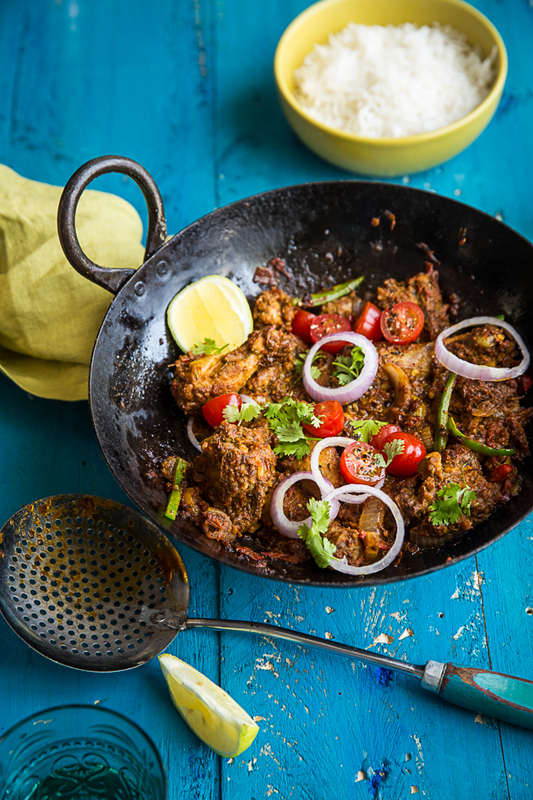 The only similarity in most version seems to be it's usually a drier preparation with bell peppers and onions similar to chicken karahi with red onions and peppers. Roast the bell peppers on open flame for 2 minutes. You just want to soften them a bit by charring the skin. Alternatively, roast them in the oven for around 4-5 minutes. Let it cool and remove the skin. Slice them lengthwise and keep aside. Collect the juices too. Heat ghee or oil in a heavy bottom pan or wok. Add the chicken and let it brown. Meanwhile, grind the sundried tomatoes, red chillies, cumin seeds, garlic, ginger, coriander powder and cumin powder into a fine paste. Add this paste to the chicken and let it continue to cook and roast in the spices. In a dry frying pan, roast the coriander seeds until fragrant. Remove and place into a grinder. In the same pan, add chopped tomatoes and cook them on high flame until all the moisture evaporates. Add this to the grinder as well and blend them together. Add this mixture to the chicken being cooked. As it hits the pan, it will pick the the brown bits that should have started to stick to the pan. This is a good thing! Once the tomatoes cook and cling to the meat add the peppers, onions and cherry tomatoes. Stir in the garam masala. Season with salt and pepper. Sprinkle in the crushed kasturi methi and give it a final stir and take it off the flame. Add the lemon juice. Garnish with coriander leaves and serve with naan or basmati rice. jalfrezi sound so good. the use of sun dried tomatoes sounds fantastic! I've also introduced spicy food to my toddler from the get go and she is totally fine with it. Your jalfrezi looks amazing. Have a great trip to India. Scrumptious looking! A fabulous dish. I love the fact that you used sun-dried tomatoes to make your chicken jafrezi. Absolutely loved the pictures. They are super gorgeous. Umm....I can eat that whole kadai with two rotis. Also loved the idea of adding sun dried tomatoes to chicken. I love sun dried tomatoes. I love them too. They add that long and slow cooked masala effect in a jiffy! My favorite Indian dish....Thanks for sharing this recipe. I made this last night and it was delicious. Two things on the recipe, you have cumin seeds listed twice, I assumed the second reference was for ground cumin seeds. You also list garam masala as an ingredient, but I didn't see what you were supposed to do with it in the recipe. I just added it in towards the end. Super delicious and beautiful photography as always! ah geez! Thanks for pointing that out Kristina. Your assumptions were bang on. Glad you enjoyed it. 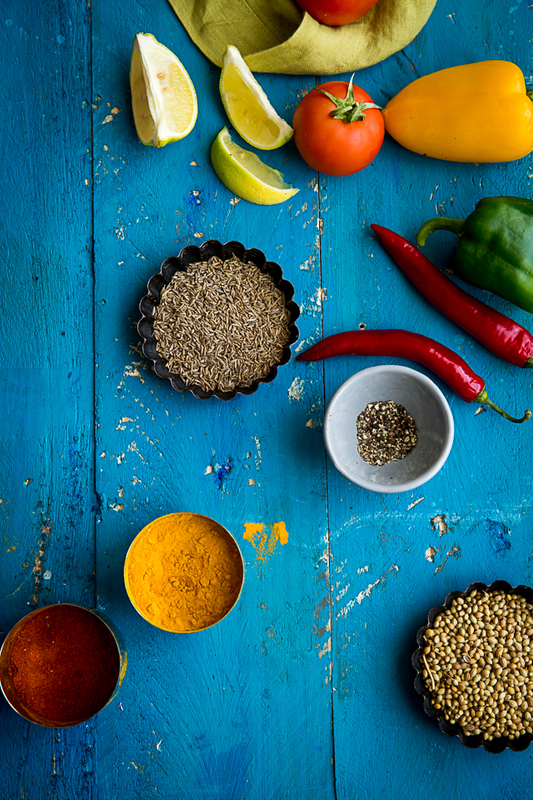 beautiful photography and great recipe - the colours look so vibrant! definitely a meal i will be recreating in my kitchen. thanks for the inspiration! Your photos are Mind blowing, Love..